The third and final book in the fantasy Divine Cities trilogy. It’s an excellent series and I strongly recommend starting with the first book, the City of Stairs. City of Miracles starts with one of the bad guys killing Shara Komayd, the former Prime Minister of Saypuri. 13 years have gone by since the end of the previous book, City of Blades. Sigrud has lost his daughter, and his best friend and leader Shara Komayed has sent him away, before he could be arrested and tried for multiple counts of murder. Sigrud has been waiting for Shara to call him back and into action. Instead, he hears that Shara has been assassinated. So, he throws away his job as a logger and sets out to get revenge. But to do that, he needs information about what Shara was doing and who killed her. He also wants to protect Shara’s adopted daughter Tatyana who has vanished. The more Sigrud finds out, the more he realizes that he doesn’t know about Shara’s final years. Shara has set herself against a powerful and ruthless enemy who has very far reaching goals. This was a powerful and wonderful ending to a wonderful series. 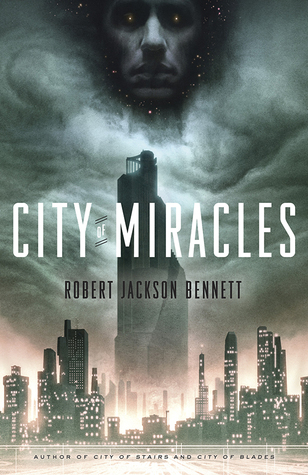 Bennett mixes espionage, mystery, and thriller with magic and divinities. He gives us a lot of new characters along with a couple of familiar ones. We get to see a bit more of Saypuri than in the previous books. Sigrud has been a significant secondary character in both of the previous books but now we really get into his head and get to know what drives him and makes him unique. He’s a tortured man without a doubt but he’s also determined to do what must be done. Great review. Glad to see you enjoyed this one. I’m quite ashamed to say I still haven’t read it. I really must make a note of all my unfinished series and start trying to make a dent in the pile. I think I have issues when it comes to finishing a series – perhaps I just don’t want them to end. And, to be honest, I’m afraid to make a list because it will be so long, although it might help me to focus and make a final decision about which series I’m not really intending to complete. I’m also in the middle of far too many series, even some which are completed. I’m making an effort this year to finish them. But sometimes I, too, don’t want a series to end. Maybe you can make a list of series you want to know how they end?